It Finally Dawned On Me To Start Listening To Bluegrass! Instead of blogging about last night's Tip Jar Jam (wonderful though it was with Kathy H, Kristina, Heather, and David), I thought I would share some thoughts from our second Women's Banjo Camp, which was totally amazing. We're already looking forward to next year, July 24-26, 2015. Posted in By Murphy, Camps, jamming, Learning By Ear and tagged listening, tip-jar jam on July 24, 2014 by Murphy Henry. I mentioned in my last Kamp blog that I was going to listen to Carole King's memoir, A Natural Woman , on the long ride home. Well, I did. Carole reads it herself and it is excellent in every way. I highly recommend it. Posted in By Murphy, Camps, Improvising and tagged Carole King, kaufman kamp on June 22, 2014 by Murphy Henry. Hard to believe but it's Saturday morning here in sunny Maryville, Tennessee, and Kaufman Kamp is over for another year! I'll be heading over to the campus of Maryville College in a little bit to pack up my unsold merch and then I'll be hitting the road. I've already gotten a text for Ben saying he'll be praying for me. I 'preciate that, Benny. Yesterday was an easy day for me. I taught one private lesson and a two-hour intermediate class and I was done. 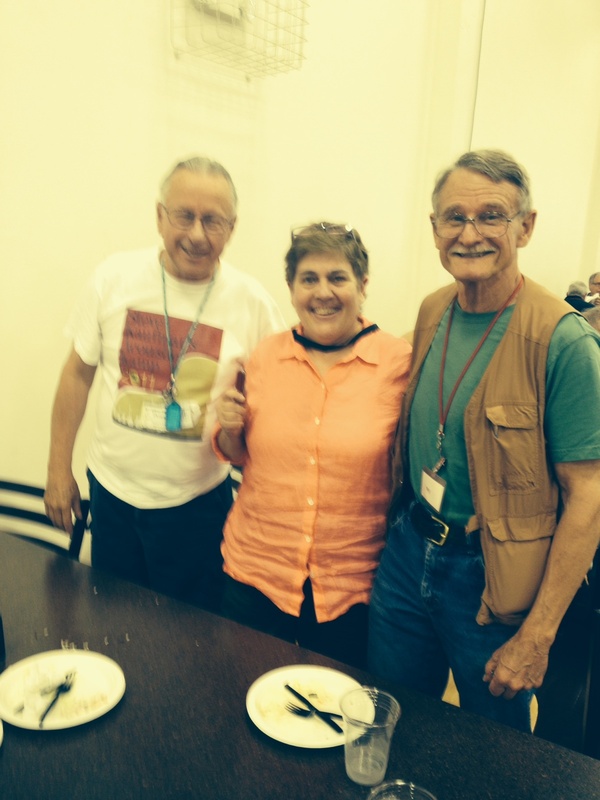 I ate two meals in the dining hall with my banjo-picking buddies Dennis and Bill (pictured at right) and for supper we were joined by our banjo-picking buddy Earl (one of the Raleigh boys) who also builds banjos. He and Bill got into a deep conversation about lathes and how to carve a banjo neck. I just kept pecking away at my green beans. Posted in By Murphy, Camps and tagged kaufman kamp on June 21, 2014 by Murphy Henry. Steve Kaufman always lets the instructors have Friday morning off while the campers participate in the band scramble so I had a lovely sleep in! Yesterday was a busy day at camp with one class scramble, one regular class, one private lesson, and another Master class. For the class scramble each instructor gets to pick any music-related topic in the world to talk about for two hours and any of the students can attend. Naturally, I chose to talk about my book! As I walked into the building where my teaching room in, I met one of my beginning students coming out. He said he'd wanted to attend my Scramble but when he got up there, it was all women, so he thought he'd go somewhere else. I told that to the women when I got up there, and one of them said, "Now he knows how we feel!" I spent a wonderful two hours talking about the women in my book with other women who actually know something about bluegrass. That made it much more fun for me. Posted in By Murphy, Camps and tagged earl, kaufman kamp on June 20, 2014 by Murphy Henry. I got pulled over by the Po-leece last night! As Red says in one of his stage raps about Clermont Hosford, "I saw those red and blue lights blinking in my rearview mirror and I figured it was as good a time as any to take a break!" It was about eleven o'clock p.m. and I was driving back to the hotel having successfully performed a four-song set of blistering bluegrass with my "merry chicas." (That is a shout out to the DVD grandson Dalton is currently enthralled with, "Robinita Hood And Her Band Of Merry Chicas.") I had stopped en route to go Krogering and pick up some Ben and Jerry's and was eager to get back "home" and chow down. Posted in By Murphy, Camps and tagged kaufman kamp on June 19, 2014 by Murphy Henry. Just back "home" (hotel!) from my day of teaching where I pretty much Blue-Ridge-Cabin-Homed my intermediate classes to death today. In the morning class, we worked on first position Roly Polys, getting all the way through two upgrades: the tag lick; a hammer-on in the C lick, and the D lick from Foggy Mountain Breakdown. In the afternoon class I didn't think I could bear another hour of Roly Polys, so we did an up-the-neck break to BRCH. (Blue Ridge Cabin Home! I don't even want to write it anymore!) It included the choke lick and an up-the-neck tag lick and was rather successful, if I do say so myself. After learning all that, we had 20 minutes left in the class and since everyone was too tired to learn anything else (and I was too tired to teach anything else!) we played Foggy Mountain Breakdown in G and I Saw The Light in A and let folks take solo breaks. Posted in By Murphy, Camps and tagged kaufman kamp on June 17, 2014 by Murphy Henry. Well, after I busted my tail to write that awesome blog this morning, I could NOT get my laptop to connect to the hotel Wi Fi even after the guy at the lobby counter said he had made it work. NOT! So, when I went into my first class I asked for help ("Any computer geeks in here?") and Colby (the handsome young guy in the red shirt) hooked me up with the Maryville college internet or wifi or whatever and so I sent the blog to Casey before class started. WHEW! Now my teaching day is over and I am back at the hotel, where I myownself hooked my computer up the the hotel wifi. YEEHAW! 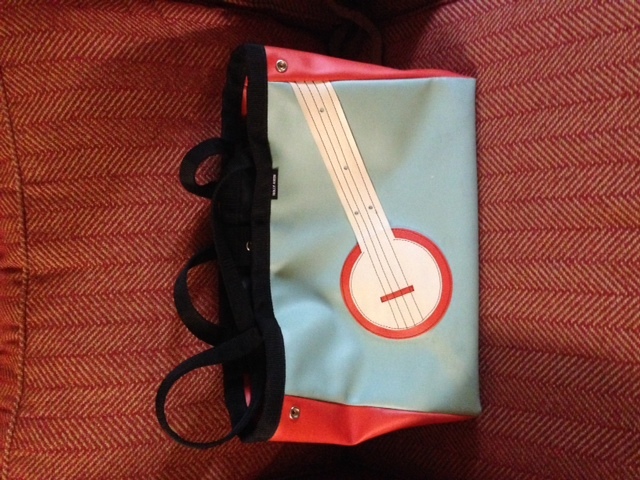 The banjo bag I carry to class. Good morning, Constant Readers! Today is Monday, June 16, the first day of Kaufman Kamp. Steve Kaufman told us last night at the Meet and Greet that this was their 19th year! Wow! I have taught here for probably six or seven years, maybe more, and Steve and his wife Donna Dixon run a fabulous camp and have in their 19 years worked out almost all of the "bugs." Posted in By Murphy, Camps and tagged kaufman kamp on June 16, 2014 by Murphy Henry. Our camp is open to women banjo players at any level (except total newbie). You should be able to play a tune or two, and know how to make the vamp chords (G,C,D) in the "F" shape. We welcome women from age 12 on up, and we have scholarship money available for young women. If you have any questions, call Casey at 615-513-8620. Or email us at themurphymethod@gmail.com. Camp info and registration here. Last year (2013) Casey and I held our first women's banjo camp here in Winchester, Va. It was a rousing success! 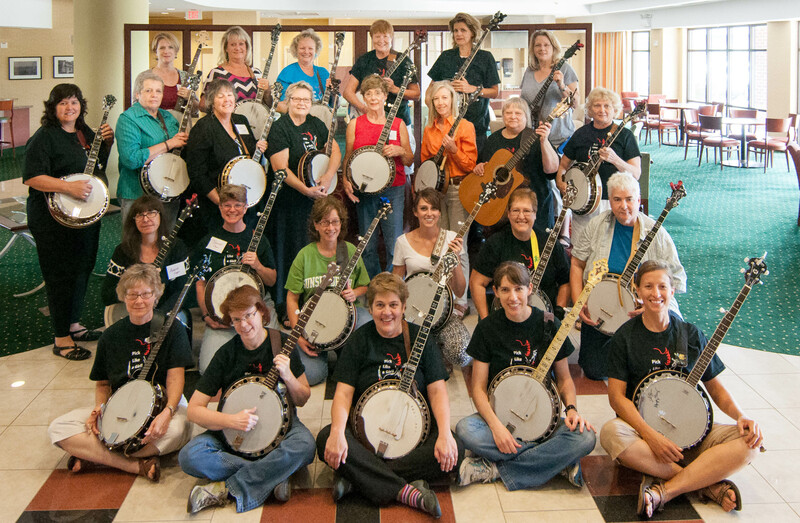 We are planning our second Women's Banjo Camp July 18-20, 2014, and we invite all you women banjo players at any level to come join us for a weekend of picking, singing, jamming, hilarity, and, of course, bonding! Posted in By Murphy, Camps and tagged women's banjo camp on April 21, 2014 by Murphy Henry.